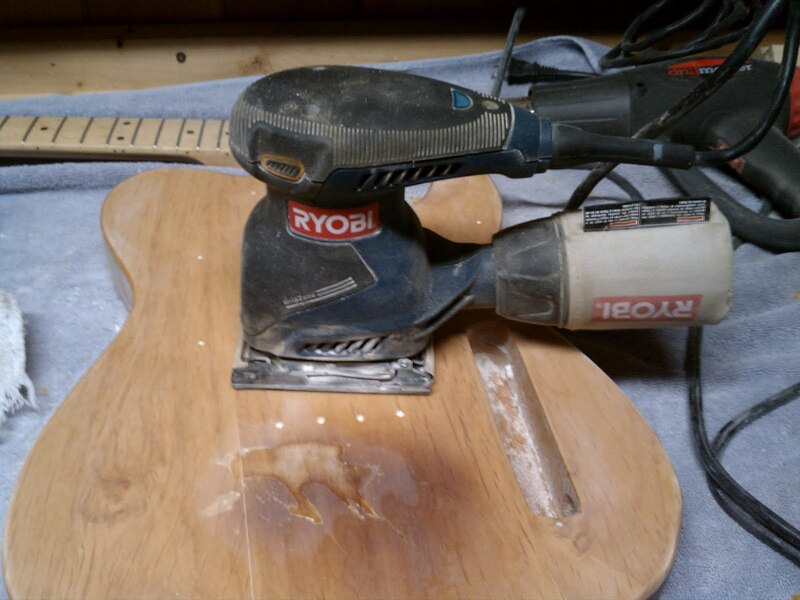 This post is titled “Get a Sander” for a very good reason. Unless you want to hunch over a guitar trying to remove 15 year old lacquer with a heat gun for the next 22 years of your life, then I suggest you take my advice. Before I get ahead of myself, I should probably address the disassembly. The guitar came apart very easily. Never before had I taken a guitar apart to this level of detail, so I was sure to take notes on how the pickup wiring interfaced with the control assembly. I know this will be handy later, rather than having to Google “how to wire a Telecaster pickup assembly”. Time to strip that finish. There I was, all proud of myself that I did the research, and found what I thought to be great advice. Go and get yourself a heat gun, and the lacquer will come right off. Yeah, and Medicare will be around when I retire. So on the advice of a good friend, I headed off to Harbor freight to purchase a discount heat gun. What the article failed to mention is that you need to keep the gun moving, or else you will scorch the wood beneath the lacquer. This isn’t a big deal as I’ll ultimately be painting the body, but it would’ve been nice to know. This is what the guitar looked like after about 20 minutes of heating. You see, it is necessary to keep the heat gun moving so as not to start any fires. This makes heating the finish about as efficient as cooling an industrial freezer with a box window fan. It just isn’t going to happen in my lifetime. There was nothing wrong with the heat gun, rather everything was wrong with the method. That’s when I felt it was time to reevaluate this situation. Sanding. That would be the ticket. I had an old Ryobi sander laying around, so I plugged it in and gave it a whirl. Wouldn’t you know it, that did the trick! After about seven or eight minutes of working on the face, I managed to get it down to mostly wood. If I had anything more coarse than 150 grit sandpaper, the job probably would’ve been even faster. I’ll do as much as I can with the sander, and touch up the tight areas by hand. You can see that it still isn’t 100% lacquer free. Just few more passes with the sander and we should be in good shape to move on to the next step, once everything arrives in the mail. What is the next step, you ask? Mockup and measurement!